We are thrilled to announce our latest endeavor: MG Press! MG Press is a micro-press devoted to publishing a small number of titles each year. An extension of the literary journal Midwestern Gothic, MG Press retains the same core values: shining a spotlight on Midwest authors by focusing on works that showcase all aspects of life—good, bad, or ugly. 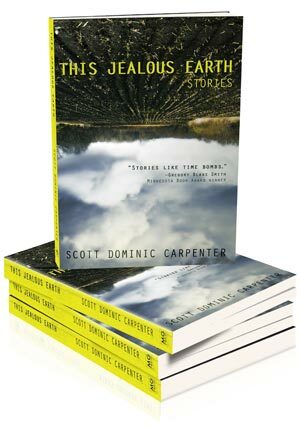 And, to double down on the exciting announcements, we’re happy to also reveal that our first book will be This Jealous Earth: Stories, Scott Dominic Carpenter‘s debut short story collection, due out in January 2013. A man puts his beloved pets to the knife; a family prepares for the Rapture; a woman in a department store slips a necklace into her purse. Whatever the situation, the characters in This Jealous Earth: Stories find themselves faced with moments of decision that will forever alter the course of their lives. Always moving and often touched with humor, Carpenter’s stories examine the tension between the everyday and the transcendent—our struggle to grasp what lies beyond our reach. Whether hawking body parts in a Midwestern city, orbiting through the galleries of a Paris museum or plotting sibling tortures in an Arizona desert, his characters lead us through a series of dilemmas of universal appeal. Scott is a remarkable author and we are ecstatic that he will be our very first Midwestern emissary, showing the literary world what we’re made of! For more information on the book, and how to pre-order a copy for only $1, click here.